The fourth in the series of coming-of-age films that marked Hou Hsiao-hsien’s transition from competent movie-maker to celebrated auteur, Dust in the Wind is based on the experiences of New Cinema multi-hyphenate Wu Nien-jen, most famous in the US for his starring role in Edward Yang’s Yi yi. The Boys from Fengkuei is generally not included in what has become known as Hou’s Coming of Age Trilogy, for some good reasons (it’s more fictionalized than the other three films and it is set in the present rather than the past) and some bad ones (film critics really like trilogies – quartets and quintets are confusing. Hou also has a Taiwan Trilogy and an Urban Female Youth Trilogy. And then there’s his 2005 film Three Times, which is like a trilogy all on its own). 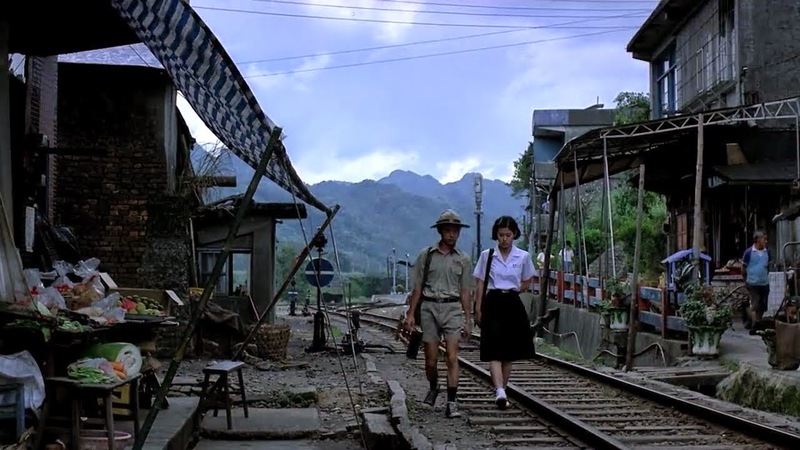 If we just take the last three in the series, we have one film each based on the memories of a single person (Chu Tien-wen for A Summer at Grandpa’s and Hou himself for The Time to Live, The Time to Die), with each focusing on the life of a young person in rural Taiwan in the 1950s-60s. The first film begins with a young girl and her brother moving from the city to the country, the third involves a young man and woman moving from the country to the city, while the middle film is set entirely in the country. The main characters age progressively as the series goes along, youngest in Summer, oldest in Dust. Taken as such, it can be seen as the history of a generation filtered through the life stories of three individuals, personal memory as cultural history. Dust in the Wind also marks the most extreme Hou as yet gone in the direction of minimalism. There is very little exposition: scenes begin and end without bothering to locate us in time – weeks, months and even years can pass by in the space of a single cut. Character motivations are rarely explicitly defined and seemingly essential narrative information is either ignored or barely glanced at. That “seemingly” is vital though, because, simply put, this style of filmmaking isn’t about the facts of a narrative, but its feelings: loneliness, loss, romance, fear, heartbreak and above all time as it is felt and as it is remembered, which are not the same thing. The story is about a young man and his girlfriend who move from their remote mining village to Taipei. They get jobs (in a print shop and then making deliveries, and as a tailor’s assistant, respectively), watch movies (sneaking in: they crash at a friend’s studio behind the theatre screen), and slowly drift apart. It’s one of the strangest romantic relationships I’ve seen on film: the two never really talk, they certainly never kiss, or even touch. They clearly mean a great deal to one another, and the boy at one point has a jealous burst of propriety (she drinks with the rest of their group of friends, a woman! drinking with men! ), to which she defiantly and rather hilariously responds by taking off her shirt in front of him and another man (don’t worry: she’s wearing at least one additional shirt under that one). This is a far cry from Fengkuei, which has a barely contained undercurrent of sexual yearning bubbling under its hero’s every action (and inaction). Even the romance in The Time to Live, The Time to Die has more passion, and it consists entirely of two scenes and one conversation, never progressing even to a first date stage (the girl sets A-Ha the task of passing his university exam first, which he promptly fails). Its one of those relationships where the two kids grew up together and everyone, including them, assumes they’ll get married and then they slowly realize that not only is that not going to be the case, they don’t even really like each other that much. Contrasting nicely with the slow cinema form of the film, with its long, middle-distance master shots, are some of Hou’s first forays into surreality (Jia Zhangke and Tsai Ming-liang, the most direct descendants of this filmmaking movement are masters of surreality). There’s a creepy dream sequence, when the young hero imagines a shaman ministering to him while he has a fever, followed by a long dream (memory) about his grandfather blaming his illnesses as a small child on evil spirits aroused by his father not giving him the agreed-upon last name, a story that looks ahead to The Puppetmaster. There’s the most extensive use yet of trains in Hou’s cinema, complete with 1890s-vintage “ghost rides”, the camera mounted on the front and back of trains as they roll into and out of tunnels in the heavily forested mountainside. Most surreal of all is the presence of Li Tien-lu, the subject and star of Hou’s 1993 film The Puppetmaster, here playing the grandfather: impossibly skinny yet spry and wickedly funny. He’s the heart and conscience of the film, an audacious move for a film that is supposed to be about two young people coming of age. Li will play much the same role in Hou’s next film, Daughter of the Nile, one which got some festival recognition on its release but has yet to be distributed on video in the US. Of all Hou’s post-Fengkuei films, it’s the least-discussed, the most readily dismissed. But if my hazy viewing of a bad VHS dub is any evidence, it’s pretty good. I certainly hope its distribution trouble that has led to its neglect (the film makes extensive and unlicensed use of The Bangles’ “Walk Like an Egyptian”, as I recall) and not the fact that it’s about an Urban Female Youth (and therefore not as serious as the Men Coming of Age and History of Taiwan trilogies). Also, unfortunately, undistributed is a film directed by Wu Nien-jen himself, A Borrowed Life, that is a kind of a biopic about his father. It makes a great companion piece to Dust in the Wind, filling in the gaps before and after the time of the Hou film. In style it is quite similar to The Time to Live, The Time to Die, and the father is a fascinating figure, a Japanophile Tiawanese man who suddenly finds himself, just as his adult life is about to begin, living in a post-Japanese society. The glimpses we get of the father in Dust in the Wind are tantalizing (especially his penchant for getting drunk and moving rocks around, which recurs in the later film), and a whole film about him does not disappoint. There’s no grandfather figure in that film, however, which makes me wonder how much Li Tien-lu’s performance in Dust is based on Wu’s actual grandfather and how much it is just Hou wanting to get Li into his movie because he makes everything better. After Daughter of the Nile, Hou would begin his next and most celebrated “trilogy” of films, with 1989’s A City of Sadness, 1993’s The Puppetmaster and 1995’s Good Men, Good Women. Only the third of those is playing on film here in Seattle, but the other two will be playing on video, for free, at Scarecrow on March 30th and 31st. I’ll be seeing Good Men, Good Women this Friday when it plays at the Film Forum, but before that is 1998’s Flowers of Shanghai on Monday and 2001’s Millennium Mambo on Wednesday, a pair of films very different in style and subject from the kind of movies we’ve seen in the retrospective thus far.